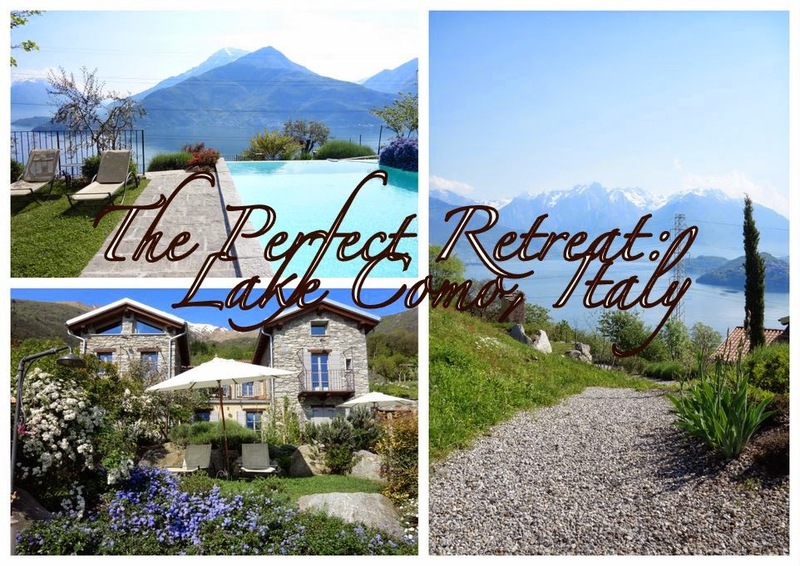 Last weekend, Magro and I went for a little mini-break on Lake Como. I organised it all myself and booked the hotel, a beautiful agriturismo overlooking the lake, in secret. I wanted to say thank you to him for letting me move in with him this year and for always being so generous and wonderful. After the hike on Friday, we jumped in the car and drove on for 20 minutes until we found signposts for the Agriturismo Tre Terre pointing up a perilously steep and windy road. Ten terrifying minutes later and we were up on top of the world with the whole lake stretched before us. From the small reception, we trudged up a gravel path and some stone steps and just as I was beginning to think that I couldn't get any more exhausted, we arrived at our room. With absolutely killer views all around us. On entering the room we were cocooned in softly warm air and the scent of fresh laundry. The decor was a mix between traditional features and modern elements which gave it a cool yet cosy feel and the bathroom (which doesn't appear here) was absolutely amaaaazing! It was perfectly toasty for getting undressed for the shower which was excellently spacious and modern. It even had little spotlights in the wall that made the water glitter as it cascaded down! A really nice touch. Our tiny little curtained cubicle at home with water pressure to match its 5th floor residence was certainly put to shame. But by the end of the evening, the most exciting prospect for our weary souls was sleep. Luckily the bed was deliciously comfortable. It felt so good to curl up in those clean sheets after a long shower and a hearty meal. There's not much I can really say about the garden except that it was absolutely fantastic and I wanted to spend the whole weekend sprawled on the deck chairs out there reading. Just look at those views! Each ground floor room has its own patch of the garden which is separated by low bushes and shrubberies. Even though the rooms next to us were full (in fact the whole place was booked up for the weekend), we were on our own out there for most of the time apart from when our neighbours' two dogs bounded over to say hello! Everywhere we looked there was unbeatable natural beauty, peppered by humble human touches. Even though I was absolutely absorbed and engrossed in my book (Leaving the World by Douglas Adams if you wanted to know), I couldn't help but look up and gaze at the incredible sights spread before me. So let's get onto the important stuff. After we had lazed around for a couple of hours, it was time to get dressed up for dinner. Tre Terre has recently opened their own osteria which is really handy as it means that now the whole family can get drunk without having to worry about a designated driver to manoeuvre the tight turns on the way back. It's a very cosy experience with space for only 15 people so we were advised to book in advance. Knowing that we were spending a day on the mountains before, I did just that. We came out of our room and crunched back down that gravel path, getting another look at the rocky peaks before they faded into the lilac dusk. Our table was lovely and I had a very nice view of the mountains out of the window. There were people eating outside too but they must have arrived earlier whilst the sun was still blazing. Lots and lots of carbs and cheese and wine. Above: Gnocchi ai tre gusti with cheese. Yum. Even more yum though was the polenta uncia we shared. Polenta is a very typical dish in the North of Italy and is described on many translated menus as "cornmeal porridge". Don't let that put you off though. The polenta uncia is smothered in butter, garlic and sage. Heaven! Magro, who grew up with a nonna from the Veneto region (famous for its polenta eating capabilities), said it was the best polenta he has ever had. It seems a bit blasphemous to say that about your Veneto nonna's polenta but nevermind. It was damn good, I have to admit. Even if I could feel my arteries clogging with every mouthful. Magro had fresh homemade cannelloni filled with vegetables and cheese (of course). For some reason, we were feeling particularly optimistic when we sat down and ordered a second course. This is a kind of vegetable pudding smothered in cheese and accompanied by fried aubergines. Yep, I'm definitely going to die of heart failure and soon. Again, it was bloody delicious. We shared a dessert in the end. I was too curious to say no but too full to go all the way myself. This crepe was full of chocolate, pear and topped with zabaione. Delicious although there was a texture that I personally wasn't too keen on. We still polished the plate clean though, even after all of that cheese! These photos don't do any justice to the views which at night are equally as breathtaking for all the contrast between the inky night and the glittering towns. Above you can see the outside eating area which is absolutely beautiful on hot sunny days for a long lazy breakfast. The next morning we woke up to sunlight flooding the room. If you're a light sleeper, I recommend that you take a sleeping mask as the curtains aren't that thick. There's the option to close all the shutters but it's nice to be able to wake up and see the sun streaming in! I was so so tempted by the pool but on that particular glorious morning, we had decided to get down on the lake and do a spot of ferry riding. I tempted fate and left it to the evening... and lost. No swimming pool for Lucy. It was overcast when we got back and poured with rain the following morning. Sob! To conclude, Agriturismo Tre Terre was one of the best hotels I have had the fortune to visit and I would go back in a heartbeat. The staff are friendly and speak English, Italian and German at least and with the recent addition of the osteria, you could spend the entire weekend up on that sunny hillside, indulging in a real glimpse of la dolce vita. Two nights were €260 for both of us including breakfast - it's not the cheapest place in the world but it was such a luxurious experience, I wouldn't hesitate to recommend it if you have the budget! Those views are spectacular!! All of that food is making me so hungry! amazing review, i can feel how you love the place and it transmit to your readers! Ahhhhh I LOVED Como - such a beautiful spot in the world, and what an amazing place you got to experience - will have to add that to my 'places to return to' and list the hotel! this place looks awesome! and the food looks delicious. glad you had a great time! Grinding my Gears - What P....s you off?